Electronic Arts' big push into mobile has paid off according to its recent financial results, with Apple revealed as its biggest games retailer. EA has embraced mobile in recent years, converting its flagship titles for mobile and also buying up Plants vs Zombies creator PopCap for $650m (£470m/AU$705m). 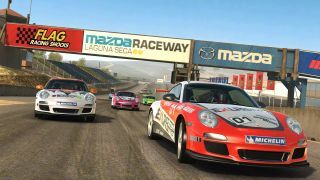 Its cosy relationship with Apple was highlighted back in September when Real Racing 3 was used on stage at Apple's press conference to show off the iPhone 5's gaming skills. It seems that it was The Simpsons: Tapped Out that managed to bring in most of the money, however, with EA COO Peter Moore revealing in the earnings call that it had its highest revenue quarter since release and that the App Store was a big cash generator for the company. "Our quarter was notable for the high percentage of revenue attributable to digital games and services," explained Moore. "To that end, Apple was EA's biggest retail partner measured by sales. And that is a first." It was also revealed that Real Racing 3 has been downloaded some 45 million times to date and 2 million people play the game every single day. Both Real Racing and Tapped Out have been created to entice users with in-app payments, so expect this micro-transactional way of selling content to continue, whether you like it or not. Although the revenue split between Android and iOS wasn't broken down, Moore's quote hints that the majority of the $90m (£60m/AU$97.6m) made from smartphones and tablets was from iOS games. What EA failed to note is that the App Store is now a bigger revenue generator than that of its own Origin service. Given the chunk of change Apple takes for each download through its store, EA may well be looking at ways to change this.